Comm Solutions Company, an end-to-end technology and security solutions provider, specializes in the design, development, deployment, and support of enterprise level solutions for servers, storage and infrastructure in the corporate, education, government and healthcare markets. Our goal is to work with our clients to help them identify what is best for their architecture and the needs of their company. 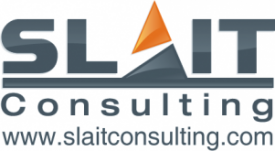 SLAIT Consulting is an Information Technology consulting services company that specializes in delivering customized, creative IT solutions for customers in the commercial and public sector. GE is the world’s Digital Industrial Company, transforming industry with software-defined machines and solutions that are connected, responsive and predictive. GE is organized around a global exchange of knowledge, the “GE Store”, through which each business shares and accesses the same technology, markets, structure and intellect. Each invention further fuels innovation and application across our industrial sectors. With people, services, technology and scale, GE delivers better outcomes for customers by speaking the language of industry. We are very pleased to welcome Fortinet as our Speaker Dinner Sponsor for Wednesday, 7th June!